TI-SmartView™ CE software emulates the TI-84 Plus family of graphing calculators on a PC or Mac®, making it an ideal demonstration tool for leading classroom instruction of math concepts. Key Press History gives students a clear and easy way to follow along with the teacher. Educators can copy and paste key presses into other applications to create class handouts. Display up to four different representations – including graph, table, equation, and data list screens – simultaneously, to help students develop a deeper understanding of topics. 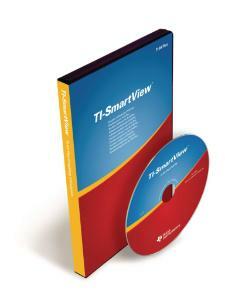 Drag screen captures from TI-SmartView™ CE into compatible applications, such as Microsoft® Word. The School-Managed License (SML) allows access to the software on a fixed number of computers. The license is activated on the license service computer that is connected to the school network. Once the client computer has connected to the network, it may use the software away from the network for up to 30 days. For perpetual term licenses, the license files require an annual license extension and reactivation free of charge. A new license number must be activated to the license service to continue use of the software.